The RPS system achieves its incredible performance by using a pinion consisting of bearing-supported rollers that engage a unique tooth profile. Two or more rollers engage the teeth in opposition at all times, eliminating backlash. There is no tooth slap as with traditional rack and pinion or gearing, instead the RPS rollers approach the tooth face in a tangent path and then roll smoothly down the tooth face. This provides a smooth, quiet, low-friction, fatigue-free, high-efficiency rotaryto- linear or rotary-to-rotary motion conversion. The RPS tooth design is conceptually different from traditional gearing. It behaves like a cam and follower versus the typical sliding spur gear used with traditional rack and pinion or gear sets. As illustrated in the figures below, a cycloidal curve is created when a point drawn on a circle at point P rolls on a flat plane to point P without slipping. When multiple points are placed on the circle at regular intervals, the cycloidal curves are repeatedly created on the flat plane, and develop into a tooth-like profile. A roller then is placed at each point P to act as pinion teeth and modifies the tooth profile to create the rack teeth. Normally, this concept will not provide zero backlash, but a technical innovation was developed to modify the tooth geometry allowing two rollers to remain loaded in opposition at all times, eliminating the backlash as the rollers engage the teeth. The rollers meet the tooth with a tangent path and smoothly roll down the tooth face. This eliminates tooth slap, sliding friction, fatigue, noise, and low precision associated with traditional gearing. 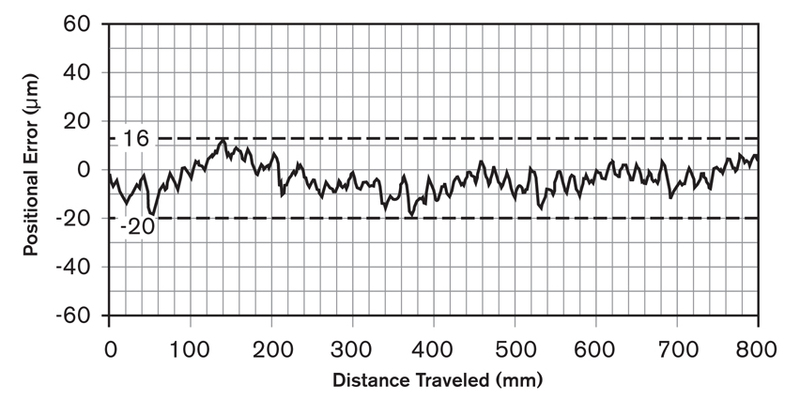 The variations shown in the graph below represent minor errors occurring throughout the pinion’s travel. The individual waves indicate each roller/tooth meshing error and larger wave patterns show pinion rotational error. As the horizontal limits illustrate, there is no cumulative error. This pattern continues regardless of distance, even when crossing rack joints due to the way the RPS alignment tool transfers the system accuracy from section to section. Regardless of the distance traveled, positional accuracy remains constant with the RPS System.